A group of four people goes out to a previously selected site. Two people are the bug team and the other two are the P-hab (physical habitat) team. Work begins at the downstream end of the chosen reach and proceeds upstream for 150 meters. Before getting in the water, the group takes various chemical measurements such as pH, electrical conductivity, and dissolved oxygen. 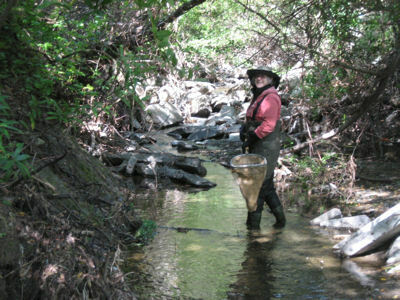 Next the bug team takes a sample at the downstream end by placing a net in the creek, resting on the bottom. They scrub the rocks for one square foot in front of the net, letting the current carry any bugs into the net. Finally they place a marker on the bank so the P-hab team can stop in exactly the same place, and then they measure 15 meters upstream and take the next sample. They take the first sample at 25% of the way from the left bank, the second one at 50%, the third at 75%, the fourth at 25% again, and so on until all eleven samples are done. The P-hab team follows the bug team and takes various physical measurements – the width of the wetted streambed, the amount of tree cover, etc. – every 15 meters where the bug team stopped and took their samples. Then they evaluate how much of each of the seven types of water flow there is in the 15 meters downstream of the sample and how much of the stream bed is dry. They take photographs at the beginning, middle, and end of the reach. After all the samples are taken, one person washes the bugs to get rid of extra soil and other debris that might be in the net. The other three take a series of ten or more measurements across the stream to calculate the rate of flow. Then all four members assess ten factors that contribute to the quality of the habitat in the reach of the creek they have just sampled and assign a numerical score to each one. These scores are then totaled to get an overall measure of the habitat quality. 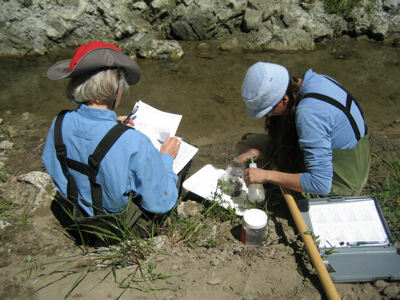 For example, they will evaluate such questions as: Are the rocks in the creek being covered by sediment? Are the banks eroding? Are there man made structures in the creek? How wide is the riparian vegetative zone? The bug sample is sent to a lab to identify and count the various species it contains. Once the results are returned, the B-IBI is calculated. A separate physical habitat score is calculated from the physical measurements taken. 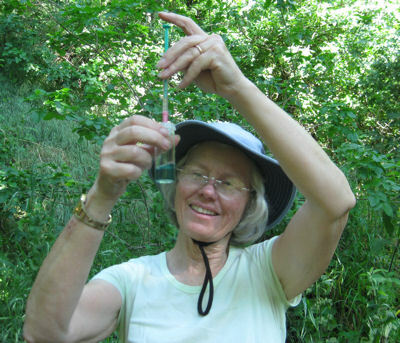 The team has collected all three types of data that bear on water quality – chemical, biological, and physical – and the results are available for further analysis and study.